This entry is part 13 of 16 in the series Belgium in a Glass. Settled under the shady trees in the Berwinne Valley, just a ten-minute stroll from the Aux Berges de la Bel B&B is the stately Renaissance Abbey of Val-Dieu. Besides simply admiring the beauty of the architecture in this tranquil setting, there are four great reasons to visit Val-Dieu. Cistercian monks first settled in the Berwinne Valley in 1216, naming it Vallis Dei, the Valley of God, or Val-Dieu in French. Things weren’t easy for the order. The original church burned during the War of the Limburg Succession, in 1287. 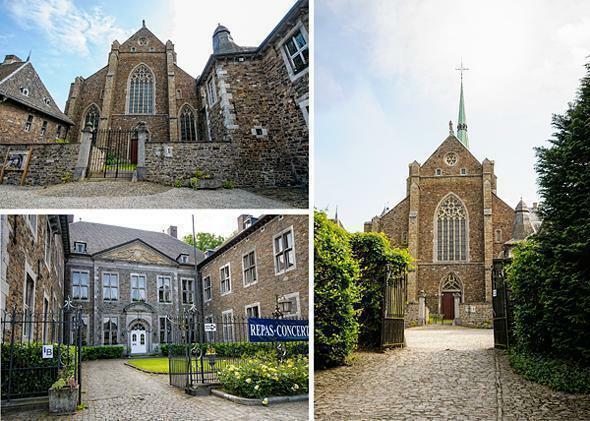 Their second church was destroyed in 1574 during the Eighty Years’ War and the third by the armies of Louis XIV in 1683. The current buildings were constructed between the 17th and 18th centuries when the abbey flourished. However, Val-Dieu was finally closed after the French Revolution destroyed the church for the fourth time. 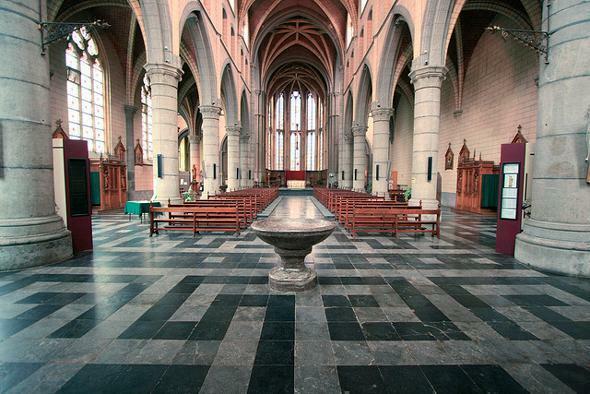 The abbey sat empty until 1844 when the last surviving Val-Dieu monk returned with four monks from the Bornem Abbey. Val-Dieu remained active until 2001 when the final three Cistercian monks left the abbey. Shortly thereafter, it was purchased by a group of lay-people, who hoped to continue the values of Christian life, according to the Cistercian Order. 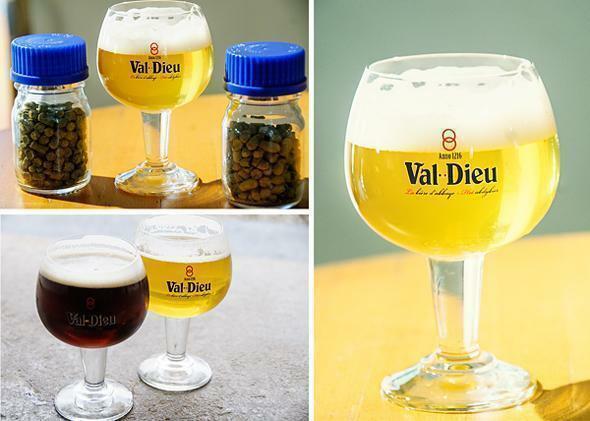 You can’t have a Belgian abbey without Belgian beer, so the Brasserie Val-Dieu was re-established in 1997. The beer is brewed based on the traditions of the Cistercian monks (although with some modern improvements.) 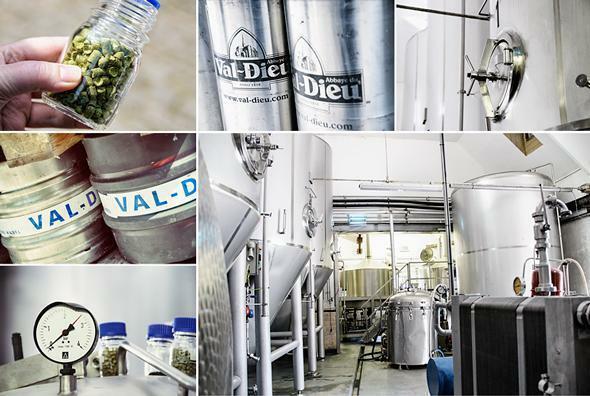 It is possible to arrange a guided tour of the brewery in a variety of languages. Val-Dieu Blond (6%) – A hazy yellow beer, it is a bit sugary when you first taste it, but it has a slightly bitter finish. Because of the initial sugar, I suggest enjoying this one after a good meal. Val-Dieu Brown (8%) – This beer is a deep ruby colour with hints of coffee and dark chocolate. There is no discernible bitterness to the beer and I suggest pairing it with some nice Val-Dieu or Herve cheese. Val-Dieu Triple (9%) – Another hazy yellow beer, but the colour is warmer than the blonde. The beer has a bit of spice and orange peel flavours but is light and soft on the finish. I suggest enjoying this on its own or with a dish featuring duck. For those seeking more exclusive options, Val-Dieu also produces a Grand Cru (10.5%, dark quadruple) and a Christmas beer (7%, amber malt). Keep the Grand Cru in a cellar, for a year or so, to let it mature, but enjoy the Christmas beer during the season. Val-Dieu Abbey’s garden dates from the 19th century and is a classified historical monument. Within this 7ha space, are a wetland, grassland, forest, creek, pond and vegetable garden. With the exception of the veggie patch, native flora and fauna are encouraged to settle here, making the space ecologically diverse. 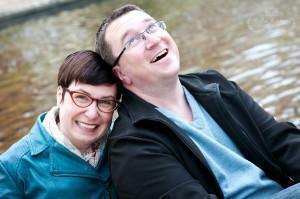 Visiting the Abbey du Val-Dieu, you have several dining options. The on-site Casse-Croûte cafeteria offers a selection of the abbey’s products as well as a few local specialities: cheeses, pancakes, freshly baked bread, and of course, Val-Dieu beer. The interior is charismatic, with huge wooden beams or you can enjoy the sunny terrace in nice weather. We opted to cross the street to the Moulin de Val-Dieu. 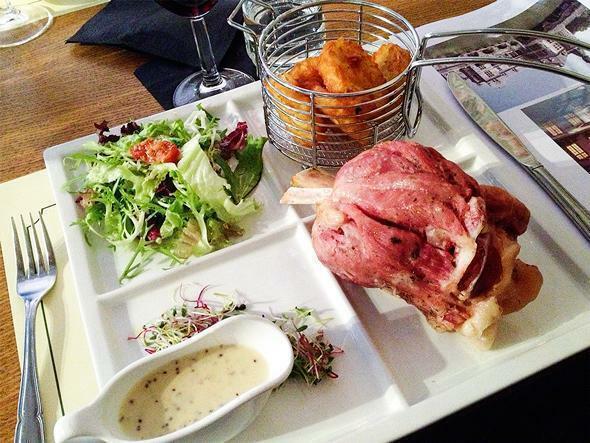 This beautiful bistro offers local specialities from Liege and the Pays de Herve. Set inside an old stone mill, the authentic details contrast with the modern restaurant features perfectly. 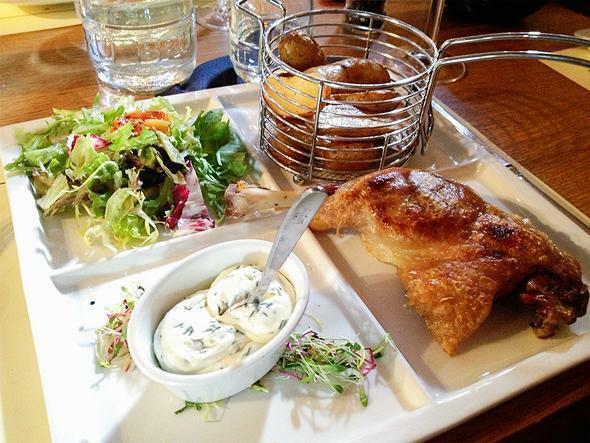 Andrew spotted his favourite dish, jambonneau with a mustard cream sauce. I opted for the house-confit duck. Both were served with potatoes and salad, and made for a delicious lunch. The Bistro also has a small shop filled with local gastronomic delights. Of course, you can purchase Val-Dieu beer, as well as the famous smelly Herve cheese, foie gras, sirop de Liege and other foodie treats. Of course, lunch on the lovely Aux Berges de la Bel terrace is only a short stroll away and another great dining option. 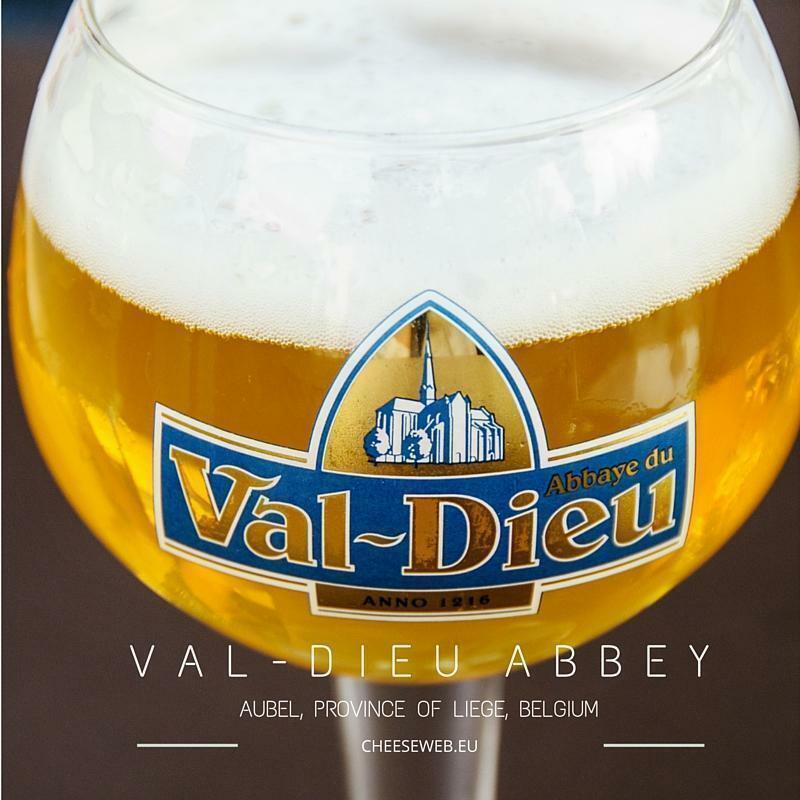 Whether you visit for the beer, the food, the atmosphere or the simple beauty and tranquillity f the place, Val-Dieu abbey is not to be missed on your next visit to the province of Liege. We’d like to extend our thanks to the Province of Liege Tourism for inviting us to experience Val-Dieu Abbey and the Moulin de Val-Dieu. We at CheeseWeb are committed to always sharing our honest opinion of any product or service we write about, whether sponsored or not. Find out more about Belgium’s favourite beverage on our Guide to Belgian Beer and Breweries in Belgium page. For more great restaurants in Belgium and beyond, check out our Restaurant Review page.